Thanksgiving is a quintessential celebration of our favorite things – food, farming and family. Ever since the first Thanksgiving in 1621, the holiday has inspired gratitude for a bountiful harvest. When you peel back the noisy layers of parades, grocery stores and football games, you can hear combines begin to quiet across the state. As harvest comes to a close, Thanksgiving is an opportunity for farm families – and all of us – to celebrate and share the fruits of their labor. Iowa’s farmers put great care into responsibly producing soybeans, pork, corn, beef, dairy, eggs and turkey. The high-quality, delicious and nutritious products raised on Iowa farms help fuel families in our communities, state, nation and world – and that’s something to be thankful for. To pay homage to the holiday’s agricultural roots, we’ve pulled together a few of our favorite farm-to-table Thanksgiving appetizer, main course, side dish and dessert recipes. Whether you stick to traditional family recipes or think outside the box, we wish you a joyous day celebrating the blessings of food, farming and family. 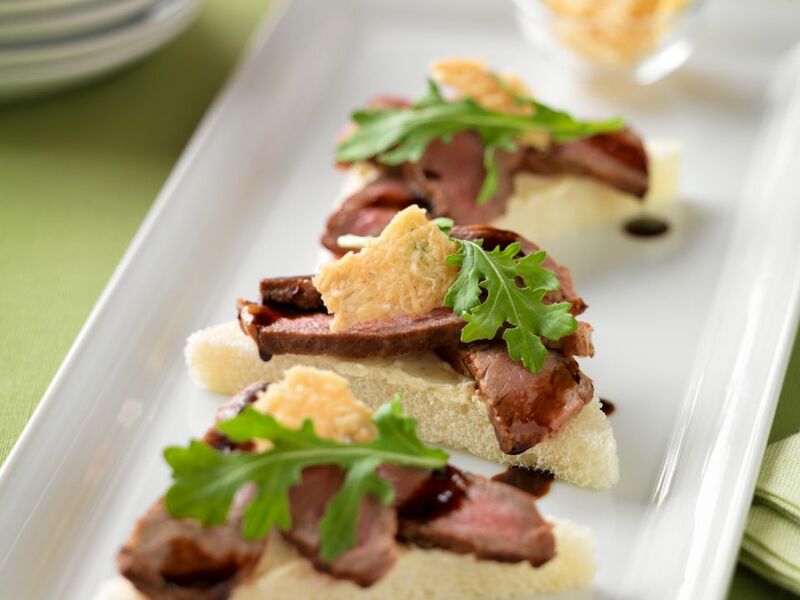 Wet your palate with this beef crostini appetizer. This recipe sets up a savory balance of flavorful steak, cream cheese and tangy balsamic sauce. Best of all, it’s American Heart Association-certified as a heart-healthy recipe. Find the recipe here. Start a new tradition with a heart-healthy hash! This unique combination of scrambled eggs, rice, quinoa and turkey sausage is sure to be a star among the side dishes. Or, it’s a perfect breakfast to power you through making the big meal later in the day! Find the recipe here. Step beyond cornbread box with this mouthwatering stuffing! This recipe from Dash of Sanity is inspired by a trip to Iowa cornfields and is the perfect combination of sweet cornbread and savory sausage and herbs. Find the recipe here. A traditional turkey is essential to your Thanksgiving feast. Whether you cook it in the oven, on the grill or in the deep fryer, the variety of meats and cuts is sure to please everyone at the table. Learn expert tips for cooking a whole turkey here. This easy, elegant and flavorful pork sheet pan meal may be the perfect complement to traditional turkey main course. Find the recipe here. Looking for a twist on pumpkin pie? Try this pumpkin cake topped with a drizzle of frosting and pecans. Find the recipe here. Cap off a filling meal with this light pumpkin tofu fruit dip! This light and sweet treat whips together silken tofu, Greek yogurt and a variety of spices to make the perfect dip for sliced apples, pears or graham crackers. Find the recipe here.